This is the readable story of one man's battle to save hundreds of jobs by taking on China and demonstrating the greatness of American business. With over $500 million a year in sales, the Bassett Furniture Company was once the world's biggest wood furniture manufacturer. Run by the same powerful Virginia family for a century, it was also the center of life in Bassett, Virginia—an unincorporated town that existed solely to fuel the business. But beginning in the 1980s, the Bassett company suffered from an influx of cheaper Asian furniture as the first wave of imports struck, and ultimately moved nearly all its production to Asia. Only one man fought back: John Bassett III, a shrewd and determined third-generation factory man who used grit, tenacity, and will to compete against China and ultimately save his family's company. 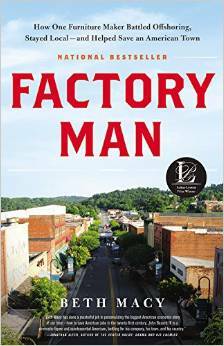 In Factory Man, Beth Macy brings to life John Bassett's business, with colorful stories from an American industry that once ruled the world and might again see better days. As Macy shows how he uses legal maneuvers, factory efficiencies, and sheer willpower to save hundreds of jobs, she also discovers the hidden history of industry in America. Vaughan-Bassett Furniture Company today employs more than 700 people, with John Bassett at the helm. His story unveils shocking truths about American business, including the hidden fallout of offshoring on communities across the country. By revealing how one businessman took on imports and won, Factory Man raises a flag for the return of made-in-America products.